If you’re not a veggie and you’ve not fallen victim to the trending veganism sensation that’s taken a firm hold of Berlin, it’s time to try out your nearest Tischgrill. Translating literally as the ‘table BBQ’, Koreans enjoy BBQ season the whole year through. It’s hard to believe there is still something new to discover for the meat eater in Berlin, what with veganism sprouting up left right and centre in the capital. Trust me, it’s worth hanging in there with the old-timers like Currywurst and Schnitzel just so you can get acquainted with the ever growing Korean food scene. Admittedly only a recent Korean eating convert myself, I am now a big, big fan. And although I am perhaps a little late to the trend, Berlin is always a reliable source for new discoveries. The city has been dealt an especially generous helping of new tastes for its inhabitants to wrap their curious tongues around. 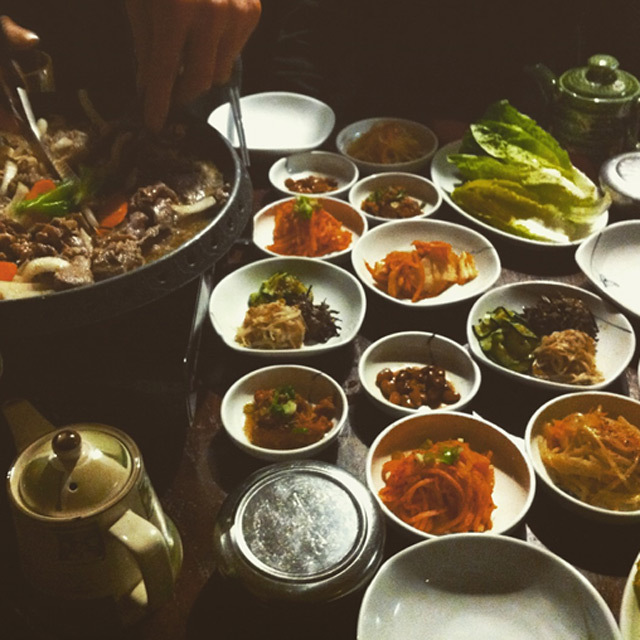 Korean culinary delights have really made a name for themselves and with good reason. The signature stars of the menu go by the name of Kimchi and Bibimbaps. The first is a fermented cabbage, which like fine wine, seems to taste all the better when aged. Appearance wise, you’re looking out for a burnt orange shade of shredded cabbage. The latter is a rice based dish typically served with beef but this is interchangeable with other meats, fish or vegetables in fact. Just say the word and an optional egg will be cracked on top too. The Korean BBQ is definitely a crowd pleaser. You just need to grab a pal, grab a table, then lean back and allow the waiter to prepare the table BBQ in front of you. The heated grill will sizzle away as the waiter cuts the meat amongst the onions and carrots. In the meantime your table will fill up rapidly with small white ramekin sized dishes carrying a variety of vegetable, potato, bean or mushroom focused side dishes. Don’t be shocked if your bite lands on some pretty spicy flavours; the Koreans like to add a kick to their food. Make your way from either Gneisenaustraße or Mehringdamm station for a fine dining Korean experience at Madang. Popular and cosy, it is definitely worth reserving a spot here. The Tischgrill is automatically accompanied by large lettuce leaves and you are free to build your leaning tower of kimchi. Try out the traditional teas on offer, including plum or date flavours. Not quite a bargain but priced perfectly in line with the large portions, delicious food and first class service you receive at Madang. In need of a grab and go? If you find yourself short of time and just so happen to be in between Tempelhofer Feld and Volkspark Hasenheide, make a beeline for Mmaah. (Likewise, if you’re near Rathaus Neukoelln on the canal, you’re in luck too) A quick and easy alternative in the shape of a gourmet snack bar, Mmaah offers up the same high quality classics such as Korean BBQ, plus Mandu (vegetable ravioli).Take out is possible too and can be prepped for whatever time suits you best.